Next available appointment at 09:00, Monday. Tuesday's to Saturdays he will be at Bearwood please call for more information 07762094741 Thank you. MONDAY'S and TUESDAY'S £10 Special offer on ALL Hair Cut. Book your appointment Limited time with this offer. We are truly greatful for you to visit our website we gurantee you that our barbers are professional and talented barber. At Smart Cutz Barbers we specializes in all hair type. Our aim is to please our customers with quality service what ever you want we make it our priority to please you. (Thank you) looking forward to see you. If you are more than 15 minutes late your appointment will be cancelled. If you can't make it for your appointment please contact us or cancel an hour or two in advance. Book an didn't turn up you will be charged a fee to rebook. Its very important for you to be on time for it affects the rest of appointments throughout the day thank you. The journey which started by someone else who see the value of Nigel. The man with a vision and a passion for Barbering .Nigel is a very creative person who always think of new ideas and always put out his best to always get quality results. It was15 year ago when the journey all begins with Barbering.Nigel talks of how his life of Barbering happened . It was just a daily commute to and from work that he passed several businesses on a daily basics on one day a man from a barber shop who sees Nigel pass each time as he commute to work each day. What did that man sees in Nigel to stop him and offer him a new venture without any experience has changed his life. He started as a trainee barber, went on to do further studies in six months of doing it he gained knowledge of Barbering very quickly and shows that leadership which also lead him in being the manager . Over the next few years he excels and build a name for himself and be known for more than just a barber he was also a business man .He help his boss from the owner of one to six shop and work with him for 10 years in West London. With all that experience and knowledge with the passion for Barbering Nigel goes in partnership with a friend with a vision and a passion they open a Barber Shop which quickly establish in London. He was able to realize that he can build a name for himself and went off to the the North of England Manchester where it takes off .But he went back to London after it takes a different turn in the business. However going back to London bring new ideas and time to think where and when to begin .He was introduced to Birmingham city where he went . But with a more cautious approach than Manchester. He work for a few months with a Barber Shop which quickly he made a name for himself and went off to opening his barber shop in Quinton . Soon business excels and thriving with excellence and has build up himself for being one the few original barber that value the Barbering practice . 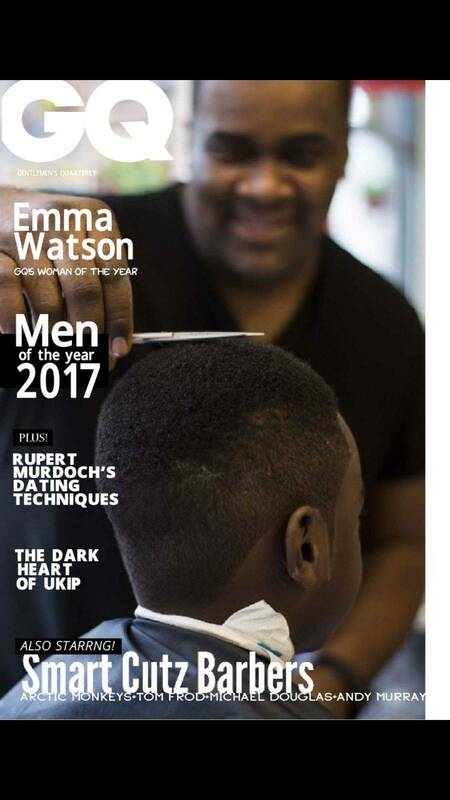 Today the 'Smart Cutz Barber ' means more than the man himself it has become a brand in it self it has grown through the likes of social media Facebook and Instagram . Nigel is a true example of how one follows the vision that someone else saw in him and he built up on it and it become a passion and a brand which continue to grow . Hi Smart Cutz Barber would like to welcome you to a new member of our team Mike. Mike's began his Barbering career during the times of grafting other 9-5 jobs he is also a hard worker reliable with great communication skills but that wasn't enough for him for he has always wanted to strive to be a successful barber. After much soul searching and unending support and encouragement from his partner he realised that his passion could indeed be his career. Mike's has resigned from his job enrolled himself and went off training . After training he has work with several barber's around the Birmingham area of West Midlands. With his confidence and courage growing Mike's becomes more hungry for Barbering and always trying his best to keep his passion growing. Today Mike aims and purpose is to strive for excellence in being a better barber and to show everyone it's never too late to follow your path to progress and succes . His mission is to continuously provide exceptional barbering service. With his 15+ years of experience doing barbering it's really beautiful to see when a career and a passion come together. He is now apart of the Smart Cutz team where he opens another chapter. From London to Birmingham the good work must continue .